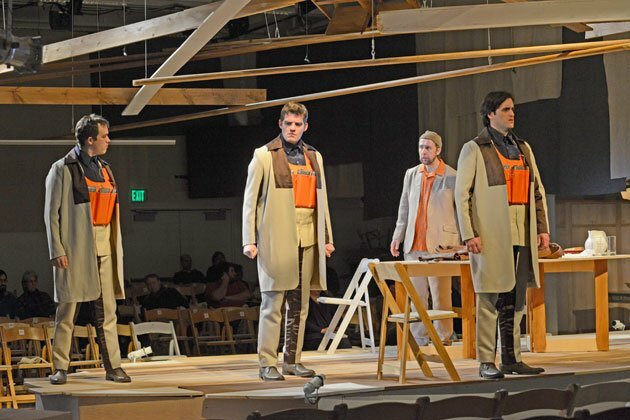 Clemency, a new opera by James MacMillan, received its North American premiere at Artists for Humanity in South Boston Wednesday night, presented by Boston Lyric Opera Annex. It is a brief, 45-minute chamber opera based on the Hospitality of Abraham or the Oaks of Mamre story from Genesis when Abraham and Sarah are visited by three mysterious characters. It was preceded by “Hagars Klage,” D. 5 (Hagar’s Lament), a very early dramatic scene by Franz Schubert. Genesis 18 presents the story in 33 short verses: Abraham and Sarah are old and childless. Three travelers come to them, and Abraham invites them in. The travelers tell them that aged Sarah will give birth within a year. They then prepare to leave. There is an unusual interlude where God speaks to himself, telling us that the travelers are on their way to destroy Sodom and Gomorrah. As the travelers begin to leave, Abraham stops them and bargains with them: might they spare those towns if they find fifty righteous people in them? The travelers agree. Abraham pushes his claim: what if it is forty-five, forty, thirty, ten? The travelers agree and abruptly leave. This is a difficult scenario for an opera: it is terse; Abraham and Sarah’s relationship is barely sketched out; the action consists of travelers arriving, prophesying, and trying to leave. Clemency doesn’t resolve these difficulties. With so little action, MacMillan and his librettist Michael Symmons Roberts must fill the time. The opera opens with an extended chant for Abraham (performed with vocal presence and great personality by baritone David Kravitz), during which time he constructs a table in front of us. The musical line, vaguely middle-eastern, is attractive; but dramatically time stands still, and not in a good way. MacMillan gives the travelers, a three-man chorus comprising David McFerrin (baritone), Neal Ferreira and Samuel Levine (tenors), license to sing at great length; they fill most of the middle third of the piece, expanding on God’s internal monologue from the divine text. First they sing of the collapse of their people; then of the evils of the towns they are to visit. The vocal writing is once again expert; MacMillan shows the same kind of skill Britten did when writing for low voice in combination with orchestra. 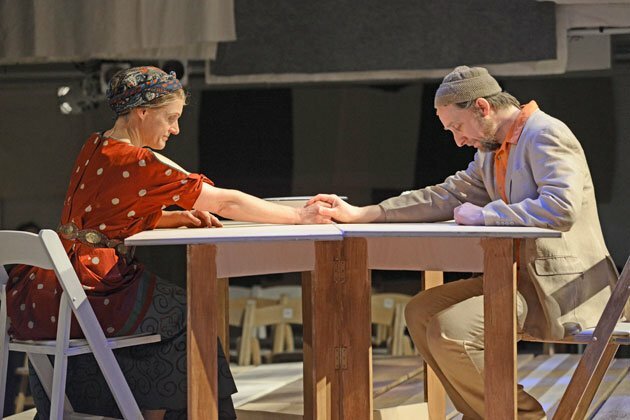 While there are a handful of striking emotional moments, as when early on Abraham and Sarah share a moment of wistful connection, most of the evening is exposition. MacMillan’s musical material is a variety of expressionist tonality; any given vocal or instrumental line hews fairly close to a tonal center, but the accompaniment is flavored with various varieties of dissonance. It evokes Britten, Bartok (especially when the music becomes rhythmic and insistent); and even some carefully diluted Vaughan Williams in moments near the end. One hears a wide variety of music, but it does not stick in memory. 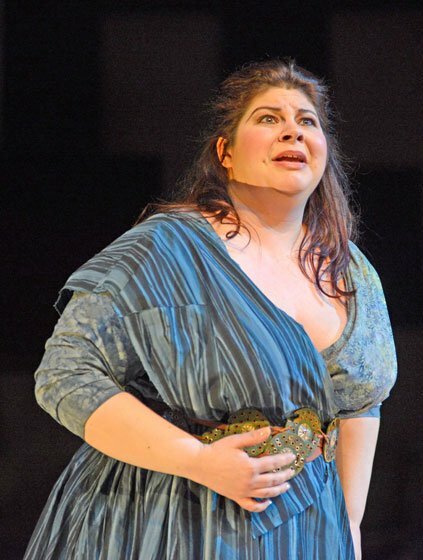 Sarah (soprano Christine Abraham) is given a couple of arias, which I recall her singing well, but which I cannot remember. This may be due to the distractions of the staging, which threatened to swamp what subtle charms the music may have had on its own. And this brings me to the deepest flaw of the production. However well-made it may be or may not be musically, it is something of a train wreck dramatically. Some of this can be laid at the feet of the composer and librettist. For example, in Sarah’s final aria, she wonders if the child she shall conceive will ever have to see the “thumbprints of smoke” left by a devastated city. This aria is meant to cap the piece, but the audience at the performance I attended was puzzled as the lights snapped off and plunged us in darkness; surely the piece was over, but the music hadn’t made its case for finishing, and we weren’t convinced. The staging only confused matters. It attempted to be both metaphoric and timely, but mixed its messages. Into the center of the large, rectangular performing space, a dagger-like wooden platform was thrust, with seating on all four sides. Over it loomed a construction of 1×6 lumber and discarded stair railing and other structural wood, bristling with seats very similar to those in which we were sitting. It struck me as a stylized symbol of destruction, a glancing reference to the detritus we have gotten used to seeing in the wake of natural disaster. In a first sign of interpretive misfire, the program notes from the stage director Andrew Eggert tell me this is instead a tree, “an organic symbol of shelter and a metaphorical referent to the presence of the divine.” If it was a tree, it was sharp and threatening. It may well have been a “metaphorical referent” to the divine, as the divine in this opera is on its way to destroy cities, but I do not think that was the intent. Around the walls of the space were some other performance niches: a child’s bedroom, a room with comfy chairs and ancient television, a kitchen. These were rarely used, and when employed they stole focus from the activity on the main stage, which was almost always where the real action was. That TV stands ready to provoke some discussion about the present-day meaning of this story; but it never does, as it is used only passively and without casting light on what the events on stage. Finally, (and please stop reading here if you are at all sensitive to “spoilers”), recall the ambiguous Travelers, those odd and distant men who predict the birth of children to old ladies and who are on a destructive mission from God. Who might they be? Abraham and Sarah have an idea; they sing, “Who are these angels?” over and over as the Travelers sing their chorus. And then the question is answered for us: the Travelers unpack their leather backpacks, bring out three hunter-orange nylon vests, which they proceed to pack with plastic explosives, and which they wear for the remainder of the opera. If this is meant to be metaphor, it collapses spectacularly; if it is meant to be social commentary, it is simultaneously confusing and risible. This casts a pall forward and backward over the piece. The Travelers have just sung a lament for their people; the libretto gets weirdly melodramatic at time, lamenting that whales suckle their young but their people do not, and that mothers who used to be tender now boil their children. They are now about to sing a song of destruction, claiming that the cities they are to bomb are filled with people who will lynch those who feed the homeless. Transforming the Travelers into suicide bombers suddenly makes the piece bristle with extra-musical questions that are not answered coherently by the production, and it swamps the action that follows. The climactic scene of Abraham bargaining for the cities hangs limply in the face of this—the music, fast and skittish, leaves Abraham hectoring these terrorists using a single repetitive argument. He is not convincing, and one is left feeling the Travelers are not so much persuaded by him as willing to agree to get him to go away. The opening Schubert song suffers from a similar problem. “Hagar’s Lament” is one of Schubert’s earliest published works, written when he was fourteen, and it was patterned after a similar song by Johann Rudolf Zumsteeg. Hagar was Sarah’s handmaid. When Sarah could not conceive, she gave Hagar to Abraham to father a child, Ishmael. This led to jealousy and discontent, and Hagar and Ishmael fled in the face of Sarah’s harsh treatment. “Hagar’s Lament” shows us Hagar in the desert, as she anticipates her death and the death of Ishmael, just before God directs her to a spring, saving their lives. Soprano Michelle Trainor’s performance was spell-binding and intense, and she negotiated some rather awkward writing for voice with confidence. If the piece over-stayed its welcome, that fault can surely be laid at the feet of the adolescent Schubert. But Trainor had to fight against a confusing stage picture. She begins describing the wasting away of her son, a small boy who shares the stage with her. However, he seems untouched by the tragedy his mother describes, and as the piece moves on from episode to episode, the boy is taken away by a old woman, put to bed; later he is woken by an old man. The boy plays with toys and then returns to his mother. The text of the song meanwhile continues on its death-and-Jehovah-obsessed way. Hagar seems not so much a lamenting mother in the desert as a domestic housewife having a psychotic episode. The dumb-show with the child, staged in one of the side-niches, steals focus from Trainor, and offers no enlightenment. The evening felt like a lost opportunity. The singing was fine and impassioned. The texts were projected on large screens around the room, but were almost always unnecessary, so clear were the singers’ enunciation and acting. Hearing opera sung in English with such clarity was a revelation, breaking down the distance I feel when hearing opera in languages I do not speak. The power of the human voice was on impressive display—Trainor and Kravitz might even need to dial it back a bit in their fortissimo passages, which threatened to overwhelm the room. The orchestra, conducted by David Angus, was wedged under a stairwell and hidden from the audience with fabric and still managed to play sympathetically with the singers and with much needed rhythmic energy. At the end of the evening, I was wondering if the piece might be more effective, shorn of the Schubert (although I would miss Trainor’s singing) and presented as an un-staged cantata as half of a conventional concert. There the audience might provide their own justifications and explanations for the mysterious travelers, and the music might have a better chance of making its case. I thought the vests and the bombs were effective in conveying the destructive purpose of the angels’ mission — although at the time of the encounter with Abraham, they are still just on their way to investigate. The destruction has not yet been definitively settled. One element of the libretto which connects with the bombs is its repeated reference to Sodom and Gomorrah as the “Twin Towns.” I’m sure play on “Twin Towers” must have been intended. But where does that lead us? Maybe it’s just food for thought, but making al-Qaeda godlike is startling, to say the least. Another element of the libretto that is strange is the flash forward to the sacrifice of Isaac, which, of course, lay well after the visit where the angels predicted his birth. Parts of the libretto were in a language other than English and, strangely, they were not projected on the screens as the English was. At first I thought they must be in Hebrew, but couldn’t make anything out (although I thought I heard “kol” a couple of times). Then, at the end of the last bit in the foreign language, it occurred to me that it sounded more like Latin. I wish they had given us those parts of the libretto, too. 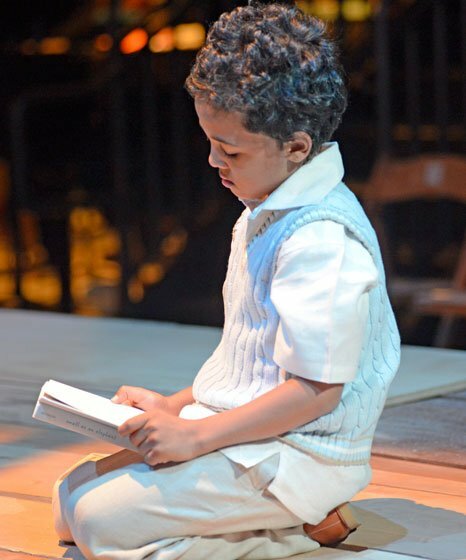 What sense does it make to put something into a libretto and conceal it from the audience. Are they playing games with us? What are they hiding, and why? But despite my questions, I think it was worth going to. It’s a thought-provoking treatment of the scriptural passages, and the music, which I agree was not memorable, was at least not tough to take. The notion that suicide bombers are God’s angels is a disturbing thought. I wonder if MacMillan agrees with Andrew Eggert’s directorial conceit to that effect. And why would suicide bombers wear blaze orange exploding vests? Hard to get through security that way. Makes me miss Opera Boston. They didn’t need to produce such incensing garbage to be relevant as there are hundreds of rare pieces of great value that never see the stage. Narcissism in the arts community is very destructive. No company is an island, you shouldn’t bite the hands that fund you. I thought the conflation of birth and death, of life and destruction, at the heart of the opera, spoke potently to a complex world. MacMillan made a surprisingly successful link between the opera and Schubert’s early song, Hagars Klage, by integrating both music (through partial string scoring) and story of Abraham’s concubine. MacMillan’s music I felt was supportive of the story, not intrusive or gratuitous. I await eagerly the CD made from this production. I was moved by this concentrated tale, with one of Boston’s best baritones, David Kravitz, filling the hall with the intoning voice of timeless ritual and the quiet salves of love and faith. I won’t forget this night. Perhaps I should have made it clear: I was not responding to the review but simply stating my impression of the production.